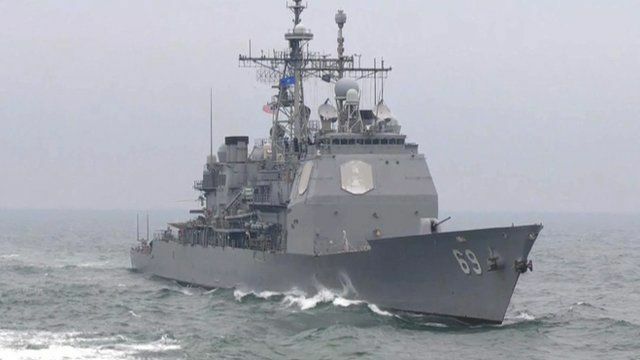 Nato begins Black Sea military drills Jump to media player The BBC's Europe Correspondent Gavin Lee has spent the day with Nato on one of the ships, as their training mission takes place. Kissinger in new Cold War warning Jump to media player Russia and Nato must "take a serious look at the diplomatic options" with regard to the Ukraine crisis, or "a return to Cold War condition is very likely", Henry Kissinger has told the BBC's World this Weekend. 'Committed to 2% defence target' Jump to media player The Foreign Secretary, Philip Hammond, has said Prime Minister David Cameron "is not prepared to preside over any further cuts to our regular armed forces". Nato will install 'integration units' Jump to media player Nato's military chief in Europe, Gen Sir Adrian Bradshaw, says Nato will install new units to respond to potential new threats against Nato states in eastern Europe. Nato warships have begun military training exercises in the Black Sea, in international waters off the coast of Bulgaria. The mission is aimed at reassuring its members in Eastern Europe in the face of Russia's increasingly unpredictable behaviour. The Kremlin has accused Nato of "aggressive war games" and warns that its presence close to the Russian border could have serious consequences for the settlement of the Ukraine conflict. Europe Correspondent Gavin Lee spent a day with Nato on one of the ships during their training mission.